It's time for another challenge from the Critter Challenge Blog. This week's challenge is to create a Fall themed card. We'd like to thank Limelight Papercrafts for being our sponsor this month, if you get a change, pop over to their website, they've got lots of great products on sale! A special thanks to all of you who've joined us for this months challenges, we enjoy seeing what you create with the challenge themes each week, watch for the winners of this months prize to be posted on the Critter Challenge Blog. I also wanted to mention the The Critter Challenge Blog is hosting a Design Team Call, you can read more information here. Sunflowers are a sure sign of Fall! 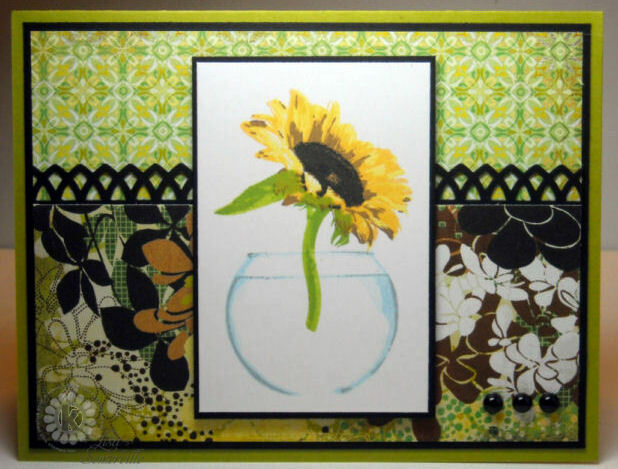 Here I used Kitchen Sink Stamps Multi Step Sunflower and 3-Step Bitty Tulip Bouquet (the vase) to create my Fall themed card. Details for this card can be found in the October issue of Crafts 'n Things on page 69. Very pretty image, I love the border punch you used & of course the papers ;-) Have a great day! Hi Lisa--just checking out your latest creation--wonderful--love that flower image & glass bowl. Hope to get back to the BC real soon. Your card is beautiful, love your sunflower and that dp is awesome. I see those brads at the bottom, nice touch! Beautiful card Lisa! The background paper and that border are gorgeous with the sunflower! Love it! Page 69 huh? Congrats on getting this beauty published!! Lovely card! I love the sunflower. Bee-utiful card, and Congrats! I can see why it's been published! Gorgeous fall card! the sunflower is beautiful and I love the dp used. When that sunflower popped up in the thumbnail of my list of favorite blogs, I just had to see what you had done! It's terrific, Lisa! Wonderful paper background and the main image really pops! Beautiful! Awesome card. Love the KSS image against that dramatic background paper. AVery pretty! I just Basic Grey. The sunflower is awesome.